ATR Resolutions, the manufacturer of the influential ATR Tile Leveling and Alignment system is soon to release its new re-engineered UNIVERSAL spindle. More robust in construction, and with larger viewing portals, the new spindle makes it easier to accurately and professionally lay your tiles. The new UNIVERSAL spindle now has a clearance of 23mm giving you the ability to lay thicker tiles. The new design is easier to grip, and more convenient to turn by hand. Importantly the spindle still fits the ATR 10mm socket bit, so the agility of the system is ensured. The new spindle continues to fit all of the ATR spacing plates including the industry changing “T” spacing plate. The “T” spacing plate is perfect for your brick pattern or offset tile patterns. The spindle removes cleanly and easily. Simply unscrew by hand or back it off using a cordless drill. NO force, No kicking, and NO over clicking! There’s no risk of fragmenting tiles or leaving unwanted obstructions behind. Clean, simple and efficient. 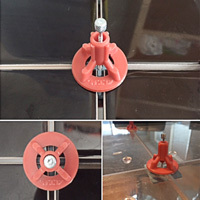 The spindle is still reusable and great value, so put them aside and store them until your next tile installation job.